No matter the specifics, divorce can be costly, both financially and emotionally. When it comes to the settlement, there is a great deal on the line. Your long-term financial well-being and economic interests may very well hang in the balance. With a large, complicated marital estate, these stakes only increase. This can impact areas like the division of property, child and spousal support, and more. As divorce is a highly emotional affair, some people may hurry to make decisions that aren’t in their best interest. When it involves a sizable amount of property and assets to be divided, such missteps can be even more damaging. 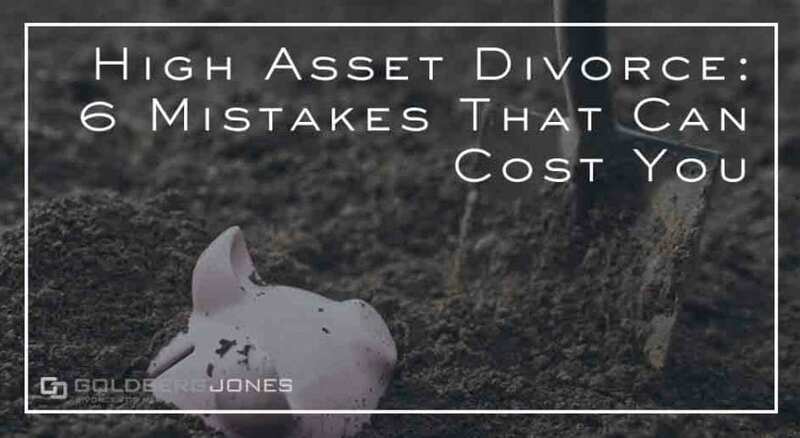 Here are some common mistakes that may get you into trouble in a high asset divorce. Making hasty decisions without pausing to consider the consequences can be an issue in divorce regardless of the amount of wealth involved. Too often people agree to terms like spousal support or an unfavorable split of assets in a rush to get it over with and extricate themselves from a marriage. Giving up too much or settling on inequitable terms can have devastating and lasting financial effects. As heated as divorce can be, it may benefit you to pause long enough to fully consider all the ramifications. This is especially important in a high asset divorce. Depending on which side you’re on, you don’t want to give up too much just to make your life momentarily easier. From the other perspective, you don’t want to walk away with less than you may be owed instead of fighting for what is yours just because it’s more time-consuming. During the division of property, all assets must be disclosed. Just because that is the rule, however, doesn’t mean people always abide by it. Some individuals may try just about anything to keep from sharing equitably with their ex. This includes transferring valuable assets, whether money or property, to a third party, or otherwise attempting to conceal them. In a high asset divorce, when a great deal of wealth is on the line, this may be even more tempting. Unless the person doing the hiding is incredibly clever, this fraud will very likely be uncovered. If that happens, your credibility is shot, and you place yourself at a disadvantage for the remainder of your case. Then again, if it’s your spouse squirreling away assets and this deception is revealed, you may be the one in the strategic position moving forward. Another mistake that is all too common in high asset divorce is failing to look for hidden resources. The court can only split up what it knows about. Ideally, both parties will be honest enough to fully disclose everything, but people can be devious. There are methods to use when investigating assets. You can examine bank records to look for large expenses you didn’t know about before. Brokerage statements may reveal purchases of heretofore unknown stocks and bonds. It may be prudent to look over recent tax returns to search for any inconsistencies. These can be complex scenarios and it may be hard to know exactly what to look for on your own. If you suspect your spouse of this behavior, it may be in your best interest to hire a financial expert or an attorney well-versed in such matters. Another branch of the same tree is failing to be thorough. This can relate to searching for hidden holdings in your high asset divorce, but it also has other applications as well. As part of your divorce, you will likely have to submit financial records and an inventory of all your resources and property. This may take time, be tedious, and seem like a horrible pain in the neck, but it is necessary. It’s vital that this record is complete, accurate, and current. You will need to be meticulous and detail oriented when compiling this list. If there are mistakes or omissions, whether intentional or accidental, it may result in increased liabilities or to giving up more assets than you may have been obligated to otherwise. One element that often goes overlooked in divorce and division of property is the potential impact of taxes. Not only will your filing status be drastically different moving forward, but you may wind up with a significant financial burden thanks to the property you receive. This is especially important in the case of high asset divorce. If resources or property you wind up with the final settlement are subject to capital gains, you may find yourself on the hook for a sizable tax liability in the near future. This can manifest in a number of areas, and impact stocks, real estate, and more. And not all items are subject to the same regulations. For instance, the sale of a principal residence will be taxed differently than an early withdrawal from a retirement account. While it may look like you and your spouse are evenly splitting your shared assets, if you’re not careful, you could face a much larger financial drain than anticipated. Before signing any binding agreement, it may be beneficial to have a professional look over the settlement. Anger often plays a huge role in divorce. There can be hurt feelings, bitterness, and a sense of betrayal. Some people let these emotions get the better of them and try to use the dissolution of marriage for vindictive purposes. Initially, it may feel good to make your spouse pay, or to keep her from getting anything, but retribution may not necessarily be the best basis for making financial decisions. Some people may try to hire the toughest, meanest attorney available to squeeze everything they can out of their ex. While you certainly want a lawyer who is willing to fight for you, a vicious attack dog may not always be the ideal choice. The best lawyer for your case may be one with a complete understanding of your situation. Especially in a high asset divorce, counsel with experience in this type of split will likely be more successful in securing an optimal result than a legal bruiser. Divorce almost always involves substantial stakes for the parties going through the split. On a basic legal and theoretical level, there’s nothing that truly separates a high asset divorce from any other dissolution of marriage, though, in reality, there are disparate concerns. When there is a larger than normal pool of property to divide, cases come with higher than usual economic risks. In order to protect your interests and your financial future, you may want to retain the services of an attorney with a history in this arena.